In 1969, McDonnell Douglas was awarded a contract to develop the Air Force's next generation fighter. The Vietnam air war had caught the service without a suitable all-weather fighter and as an interim measure, the Air Force purchased their own variants of the Navy's F-4 Phantom II. Given the rapidly declining kill ratios from World War II through Korea and into Vietnam, what was needed was a true air superiority machine. The resulting design was very large, but the F-15 Eagle was the first production aircraft that produced more thrust than it weighed. While the US Air Force didn't have the opportunity to fly the Eagle in combat during its first 20 years of service, the Israeli Air Force literally decimated anyone that opposed the F-15 in the sky. During operations against Syria in the Bekaa Valley, the F-15 destroyed around 80 Syrian Air Force MiGs with no losses, making the IDF the widest distributor of MiG parts in the world. During Operation Desert Storm, USAF F-15s swept the skies of Iraqi fighters. The USAF also pressed the F-15 into action during the second Gulf war as well as operations over Kosovo and other contingency operations. To keep the Eagle operationally relevant, the aircraft has undergone two Multi-Stage Improvement Programs to add new avionics and new weapons to the Eagle's capabilities. For many years, Hasegawa ruled the skies with their 1/48 F-15C Eagle kit as it was the tenth release in the P-series which featured finely scribed surface details and straightforward assembly. 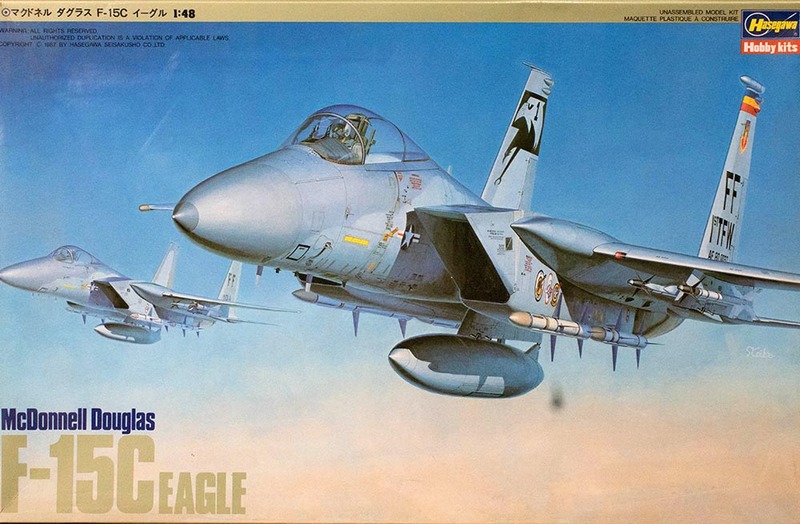 Unfortunately, Hasegawa neglected to keep their F-15C kit relevant as the real aircraft was improved and modelers had to resort to aftermarket options to render the MSIP Eagle that included the AIM-120 and the MSIP II Eagle that included the AIM-9X and the Joint Helmet Mounted Cueing System. Of course, there are other details that need to be addressed to render a MSIP or MSIP 2 aircraft, but none of them are in the box. This kit is based on Hasegawa's original tooling for the subject - the F-15A and F-15J Eagle. The kit is molded in light gray styrene and presented on six parts trees (duplicates not shown), plus a single tree of clear parts. This kit was one of the pioneers for the detailed full length intake ducts with engine faces that we take for granted today. The cockpit is one of Hasegawa's better offerings and the rear pit behind the ejection seat is nicely done as well. There are numerous aftermarket cockpit sets and detail sets available for this kit, but this one will look nice straight out of the box. Exhaust nozzles - The USAF F-15s are powered by the Pratt & Whitney F100 engine, the same powerplant as the F-16A/B and the F-16C/D Blocks 25, 32, 42, and 52. The Pratt F100 has 'turkey feathers' to streamline the exterior of the engine nozzle to avoid airflow drag. While the F-16s still retain these turkey feathers on their nozzles, testing revealed that the absence of turkey feathers on the Eagle did not contribute significant drag in flight but their removal saved manhours of maintenance. At some point early in the Eagle's career, the turkey feathers were removed from USAF Eagles. The Japanese retained their turkey feathers on the F100 engine for a number of years later, but they too are now removed. Israeli and Saudi Arabian Eagles still retain their turkey feathers. This kit provides only the nozzles with turkey feathers. Hasegawa has since released updated versions of this kit with additional parts for the featherless version at a much higher suggested retail price. Not to worry, there are aftermarket options available. Missile rails - If you're building a pre-MSIP Eagle, no worries, but if you're going to mount AIM-120 on your bird, you'll need the beefier looking LAU-128 missile rails that replaced the thinner AIM-9 launch rails. These too are available in the aftermarket. AIM-7 Sparrow - For whatever reason, Hasegawa produces 'generic' Sparrows for their kits which can easily be addressed with strip styrene to create the cable troughs that are mounted external to the airframe. You can see the differences in trough details between the AIM-7E and AIM-7F/M and it is worth the effort to add these details to the kit missiles which are otherwise just fine. External tanks - Hasegawa only provided two tanks in this release, though you'll often see the Eagle with a single centerline tank or three. If you want the latter option, you'll have to steal the F-15 600 gallon tank out of another F-15 or F-4G kit. Cockpit - The MSIP updates also changed out the instrument panel and other area in and behind the cockpit. Aftermarket cockpit sets are available to address these updates to the front office. Pilot - Most modelers don't use the pilot figures provided in these kits and that is a shame. The figure in this kit has the older hard-shell helmet used during Vietnam and into the early 1980s. You can steal an updated head with the lightweight helmet out of your Hasegawa F-16 kit or a number of other options as well. Unfortunately there are not many options yet for the helmet-mounted cueing system which has a distinctive shape. At present, the best F-15C Eagle in 1/48 is the Great Wall Hobbies kit as it has most of the items mentioned above addressed in the box. The biggest drawback at the time of its initial release was the hefty $115 USD suggested retail price which has since (thankfully) dropped to between $80-$90 USD. Unfortunately, the Great Wall kit is out of production but there is supposed to be another release soon. The only drawback here is not with the kit directly as Great Wall has a habit of introducing corrections quietly in subsequent releases as we saw in the numerous P-61 and MiG-29 versions which saw details like the radome in the P-61 and the external tanks of the MiG-29 corrected. The Hasegawa kit, which is also currently out of production, can be found at kit swaps and even on eBay for $20-$30 USD and the 'Hi-Grade' edition with the featherless nozzles can be found around $65 USD (or better). The other options for an F-15C in 1/48 include offerings from Academy, Revell (Monogram), and Tamiya, but these too have their challenges which are outside the scope of this discussion. Given that the Revell 1/48 F-15E is the best kit of that subject in this scale, it is a pity they didn't circle around and update/revise their original F-15C tooling accordingly. With the wide range of aftermarket details/corrections/updates on the market as well as some great aftermarket decal sets for the F-15C, you can render this cold warrior from its early days in the 1980s to present and there are also great options to render not only the wide variety of USAF users, but also Eagles from Saudi Arabia (which have shot down Iranian intruders), Japan, and Israel (who still have the greatest number of MiG kills to date). Perhaps Hasegawa will take the time to revise their F-15C tooling as they have with other subjects (like they did updating their F-14 kits into the Bombcats). Until then, this Hasegawa kit remains a good foundation for the F-15C and you can also find its cousin to go back to the days of disco (the '70s) with the F-15A.